The only filtration in the world today that will reduce acidity in the body and it will produce natural calcium, magnesium, sodium and potassium ions that can be absorbed 100% in the human body. Acid wastes (from the lifestyles we lead - not only from food and drink, but also from stress and other pollutants) are dumped into the bloodstream and lymph, and then are transported to the liver and kidneys for the detoxification processing and elimination. Keep in mind that a pH of 8 and above is the only range that is beneficial to your good health: An alkaline body is when your body is in a healthy state therefore allowing your body to fight bacterial and infectious diseases as well as many other critical diseases. 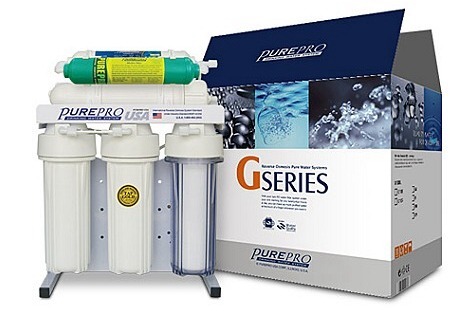 PureProR G-106A is a super quality 6 stage filter system comes with PureProR USA Alkaline Filter, to offer the very best in water filtration and balanced pH water for drinking. Using reverse osmosis technologies with alkaline filter can actually remove 99.99% of contaminants and provide people with healthy alkaline drinking water. The Alkaline filter changes the acidic RO water into a perfect Natural Alkali Calcium Ionized Water. The PureProR Alkaline filter simply gives back minerals such as ionized calcium, magnesium, sodium, potassium ion, which were taken away while purifying the water. The PureProR Alkaline filter is effective and affordable. - Help minimize the fluctuations of your body's pH. - Turn acidic drinking water into alkali calcium ion water. - Makes the water cleaner and healthier. For more information about PureProR Alkaline Filter, please click here. System equipped with stand frame that allows unit to be either free standing or can be mounted on the wall for space saving installation. The free-standing bracket design makes it easy to replace cartridges. The Alkaline filter changes the acidic RO water into a perfect Natural Alkali Calcium Ionized Water. The Alkaline filter simply gives back minerals such as ionized calcium, magnesium, sodium, potassium ion, which were taken away while purifying the water.